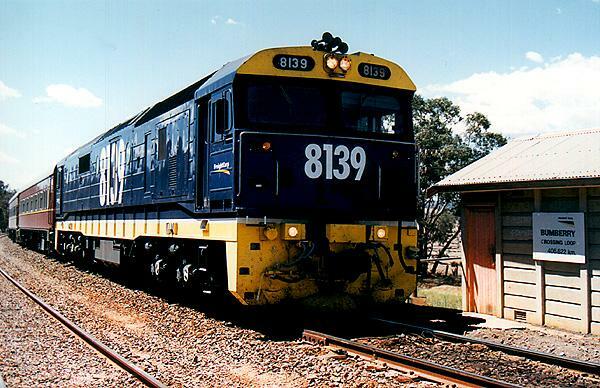 The 81 class was built by Clyde Engineering at Clyde, NSW. 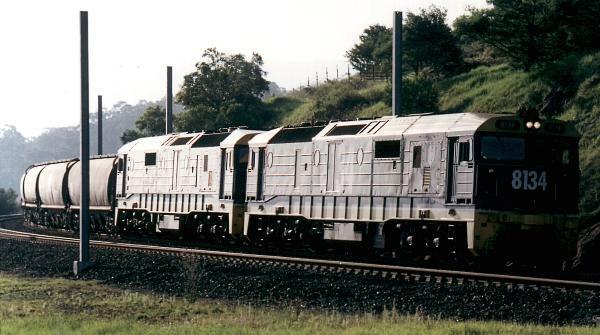 The first unit was in service on Otcober 29th, 1982. There are 84 units in the class, numbered 8101-8184. 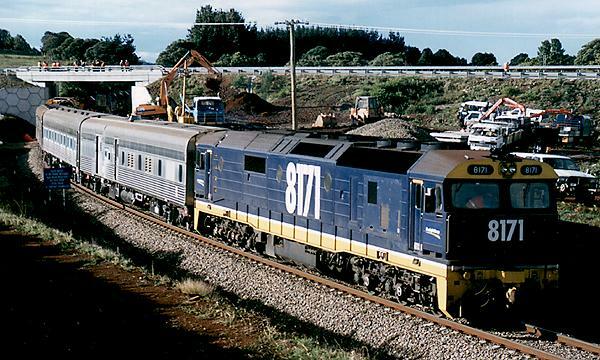 They have a V16 turbo-charged 2 stroke EMD 645E3B engine. 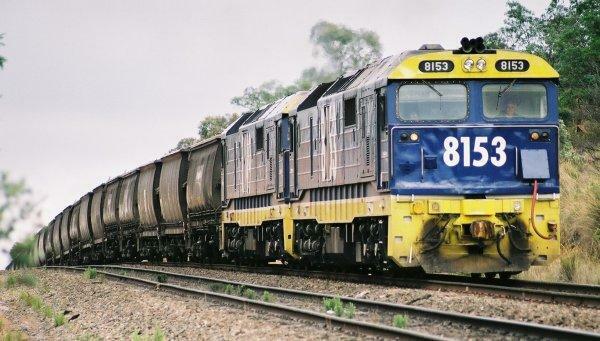 They weigh 129 tonnes and have 3000 HP available for traction. 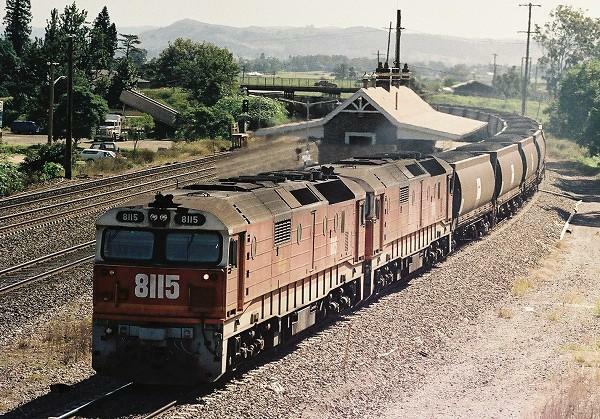 8115 leads another 81 through East Maitland on an up coal train in 1990. 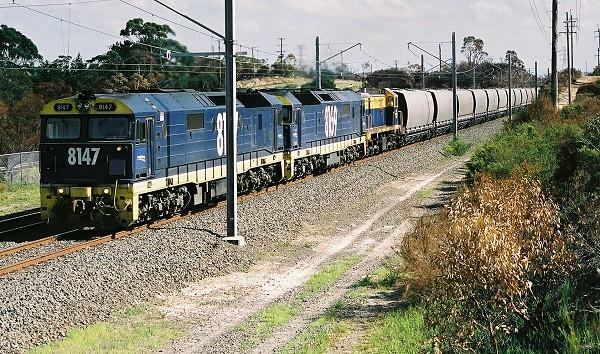 8116 & 8138 arrive at Medway Quarry with 2289 clinker train on February 2nd, 2002. 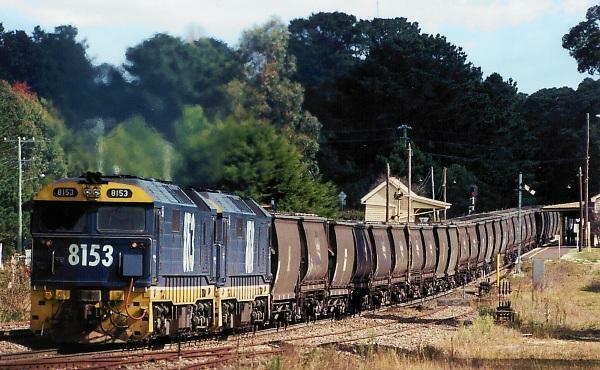 8117 & 8120 in Bicentennial lead an up coal train through East Maitland in 1990. 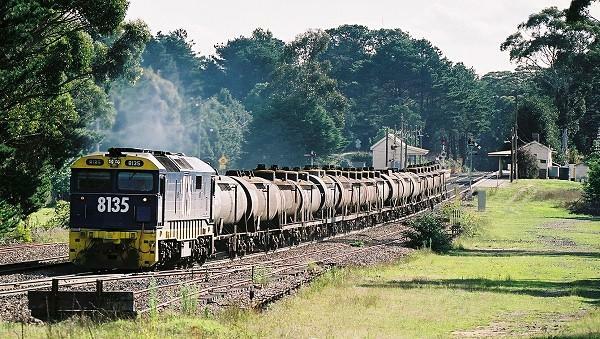 8135 leads 2138, the up Canberra Oil train through Wingello on February 8th, 2002. 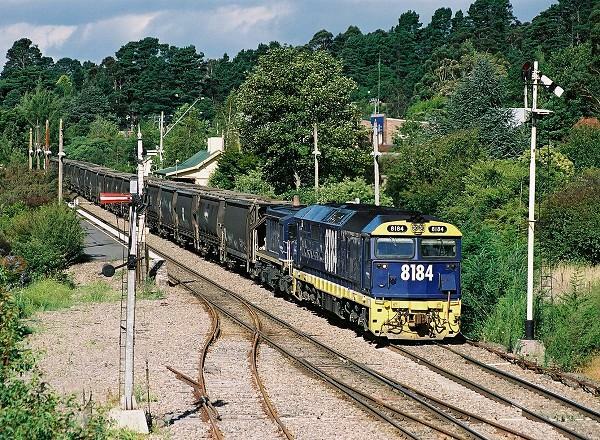 8144 leads another 81 through Sefton on a down coal train in 1990. 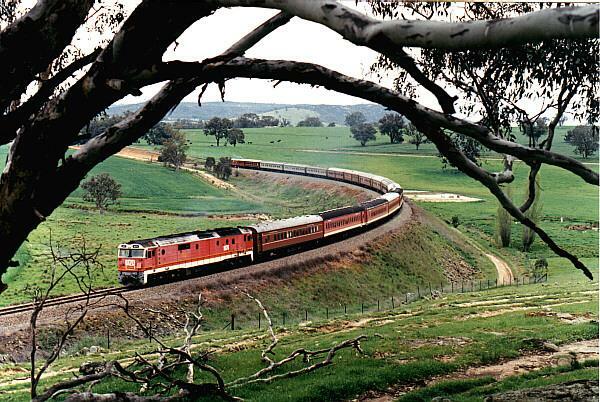 8153 leads another 81 through Goulburn on a down wheat train on February 9th, 2002. 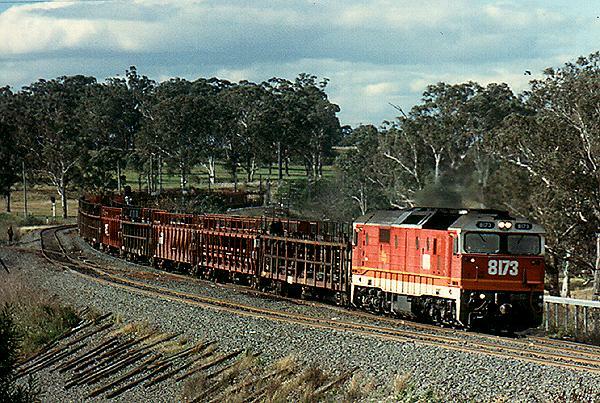 8154 leads another 81 and two 422s on an up wheat train near Macarthur in 1990. 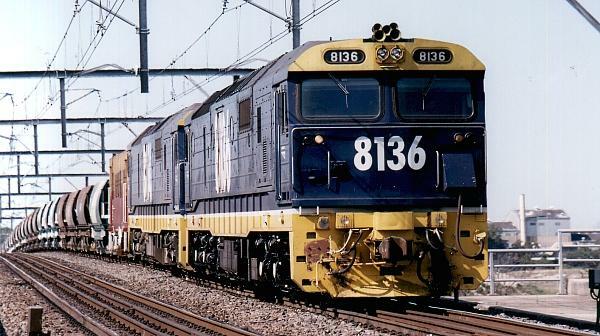 8156 leads a G class on an up SuperFreighter through Campbelltown in 1990. 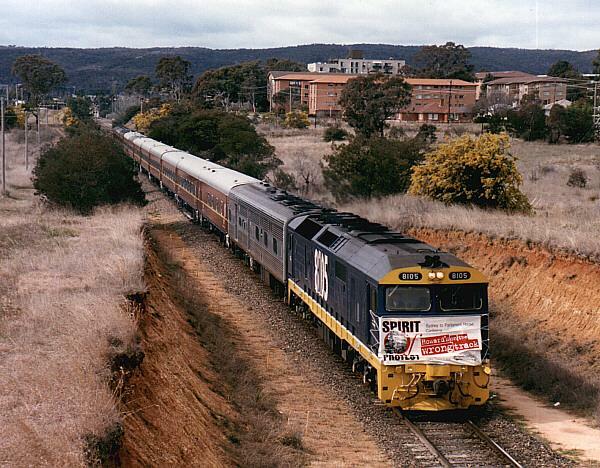 8161 leads a G class on SL-2 Sydney Express near Macarthur in 1990. 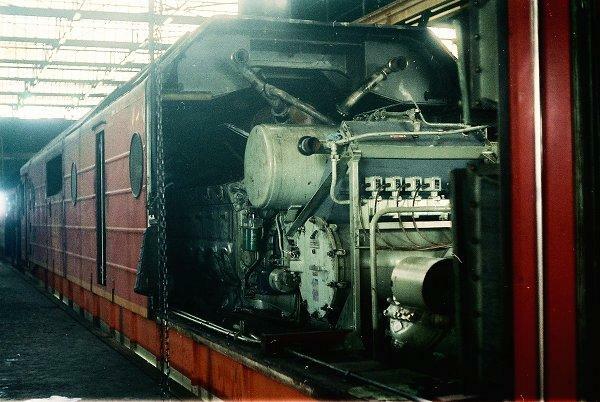 8175 gets attention at DELEC in 1990. This view shows one of the covers removed, exposing the V16 prime mover. 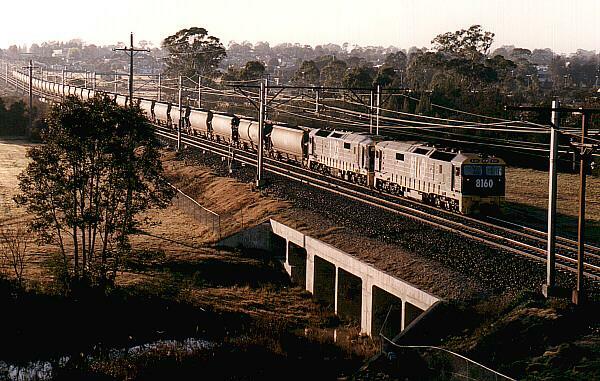 8177 leads SL65 Intercapital Daylight Express out of Campbelltown in 1990. 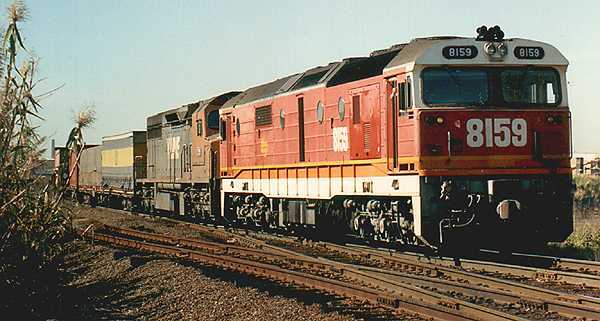 8181, 4884 & 4886 stand on the down main at Goulburn while waiting for ST-1 to overtake via the up main on February 8th, 2002. 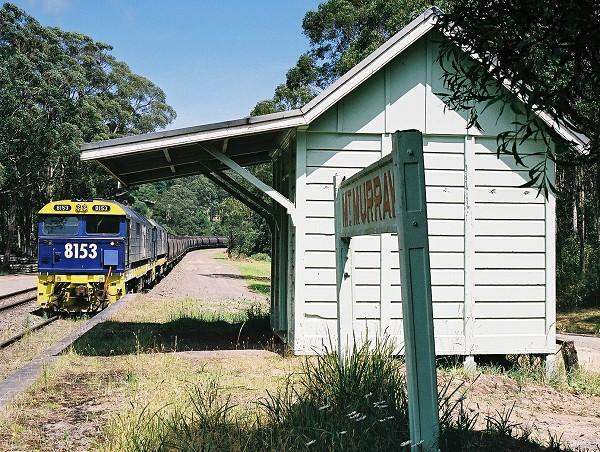 8184 & 4872 lead a down wheat train past the semaphore signals at Bundanoon on February 8th, 2002. 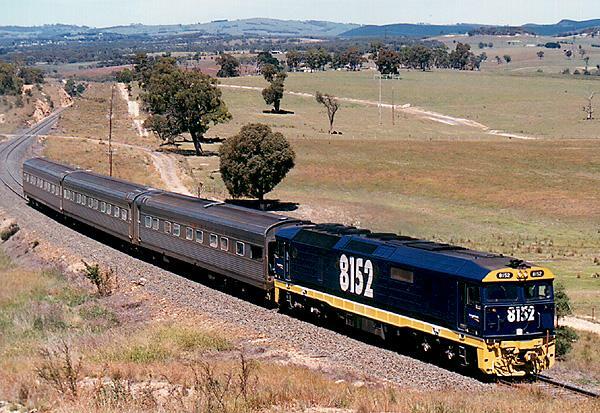 8153 and 8183 lead 8920 wheat through Mt Murray on January 20th, 2002. 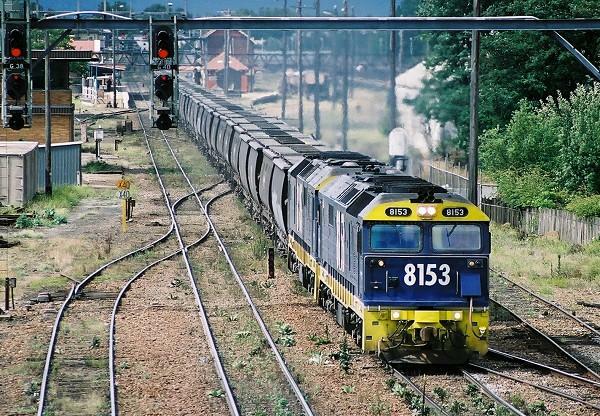 8147, 8169 and Manildra's MM01 lead 8972 wheat past a tangara through Sutherland on January 28th, 2002. 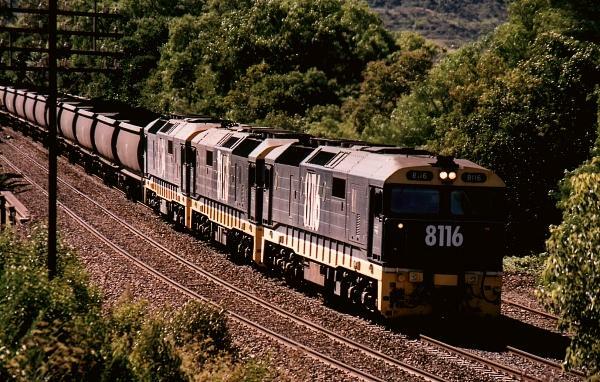 8147, 8169 and Manildra's MM01 lead 8972 wheat through Sutherland on January 28th, 2002. 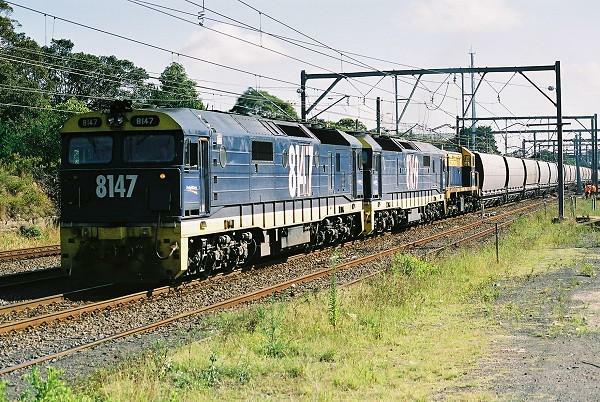 8147, 8169 and Manildra's MM01 lead 8972 wheat near Waterfall on January 28th, 2002. 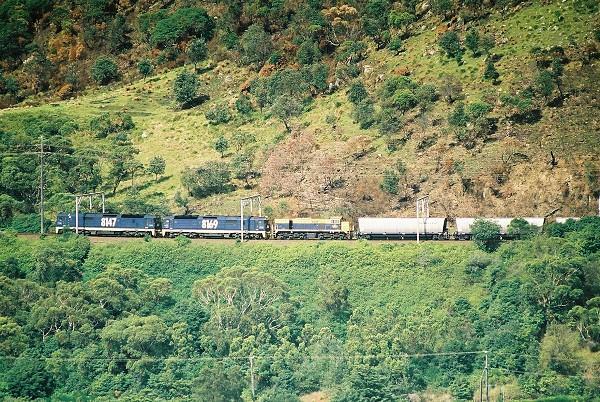 8147, 8169 and Manildra's MM01 lead 8972 at Stanwell Park on January 28th, 2002. 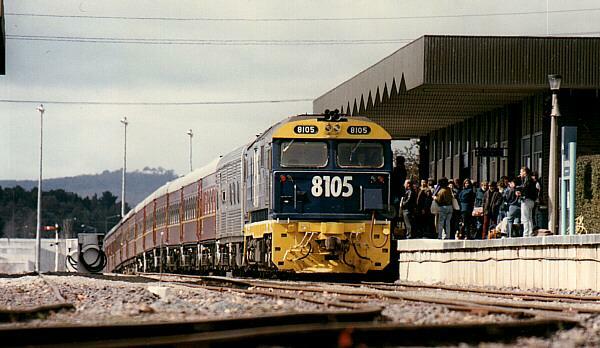 8109, 8114 & 8121 weave into Muswellbrook on a down coal train on April 21st, 1991. 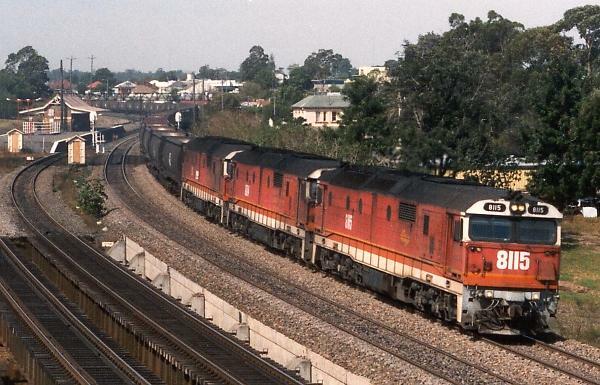 8115, 8124 & 8117 pass East Maitland on a down coal train on April 21st, 1991. 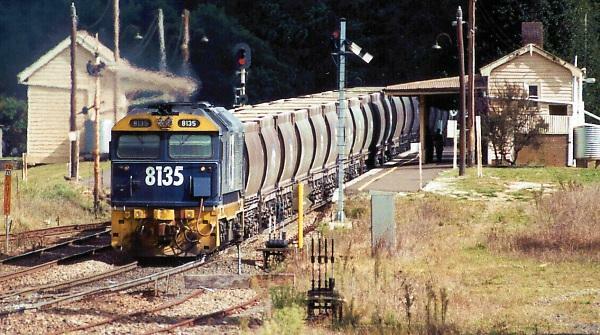 8135 passes through Wingello with an up clinker train in April 2000. 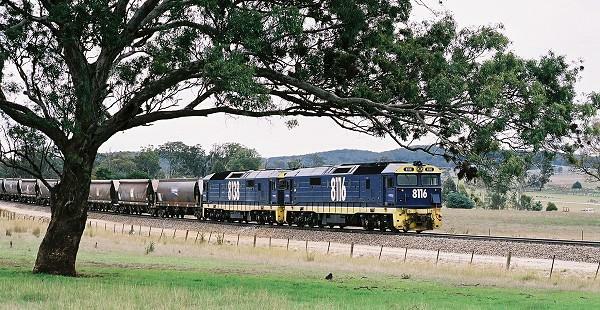 8153 & 8128 pass through Wingello with an up wheat train in April 2000. 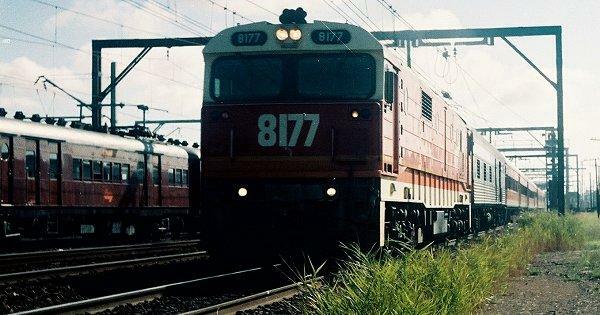 8173 leads an empty car carrying train through Glenlee Junction on July 5th, 1990. 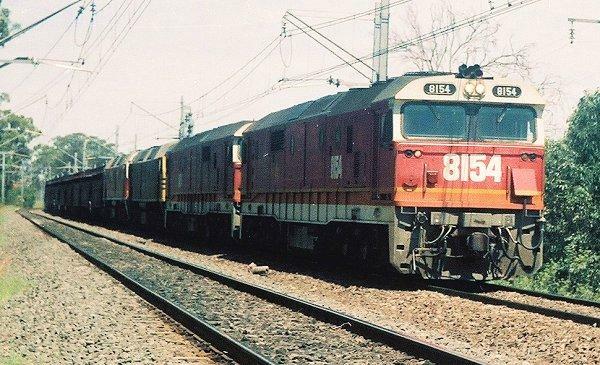 8155 and 8174 lead a down freight through Glenlee Junction on June 5th, 1990. 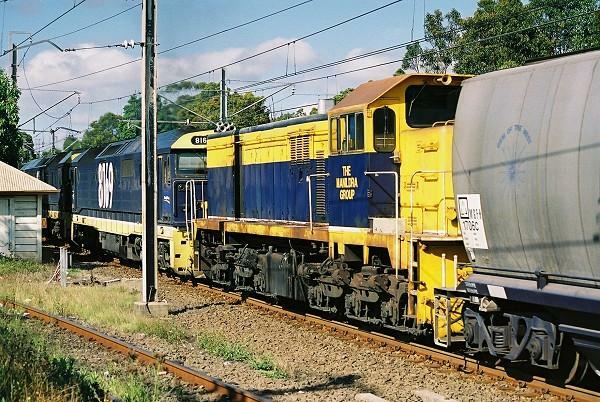 8171 stands between Ocean View and Robertson with the breakdown train following the Robertson Accident on May 19th, 1998. Taken on May 20th, 1998. 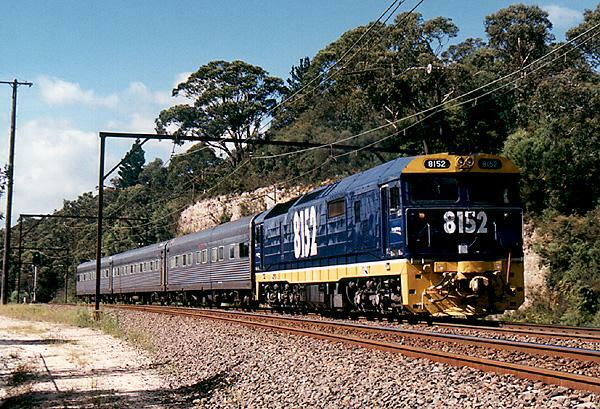 8173 and 8258 lead NR57 back to Port Kembla at Mt Murray following the Robertson Accident on May 19th, 1998. Taken on May 20th, 1998. 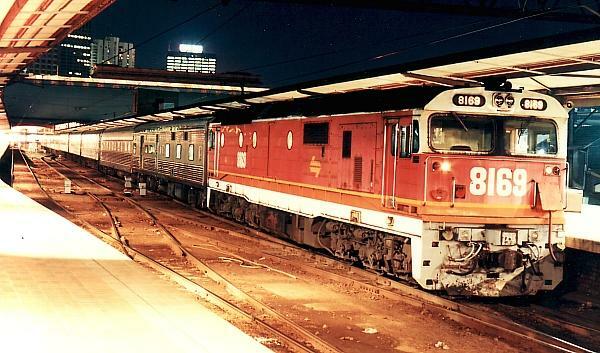 8159 and C505 arrive at Marrickville Loop prior to it being abolished as an electric staff section on May 10th, 1990. 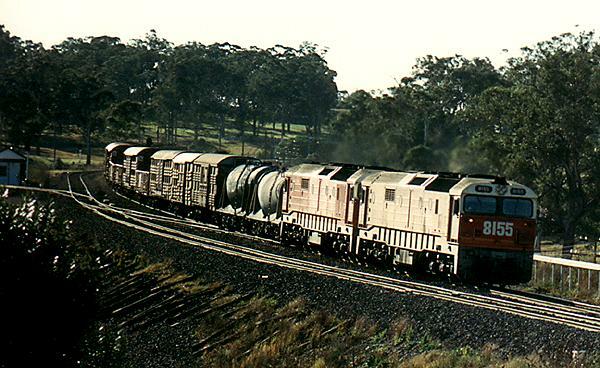 8125 & 8116 lead a Baal Bone Coal train into Baal Bone Junction on February 23rd, 1998. 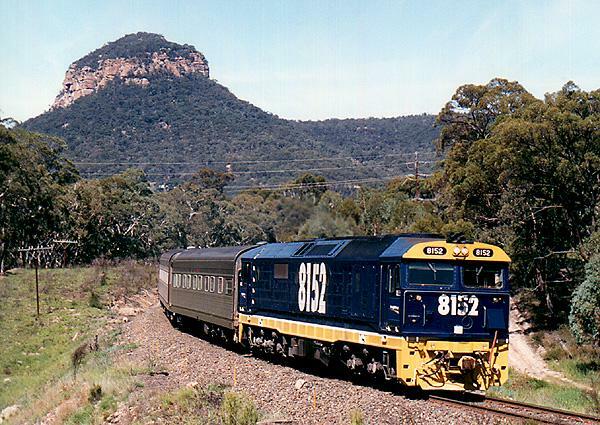 8139 leads WL33 to Broken Hill, pausing at Bumberry to exchange the staff a month prior to the introduction of Train Order Working. March 7th, 1998. 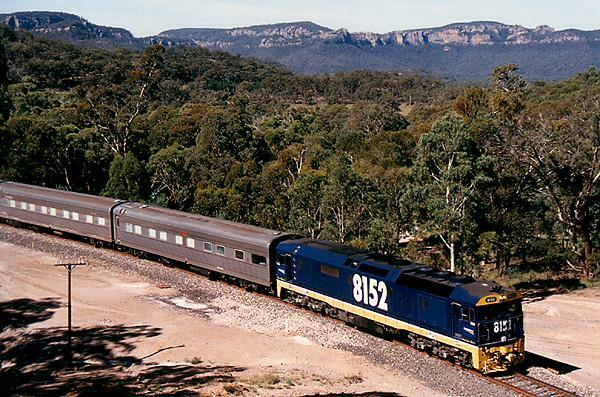 8152 leads RSA's track Inspection Train near Wentworth Falls on February 23rd, 1998. 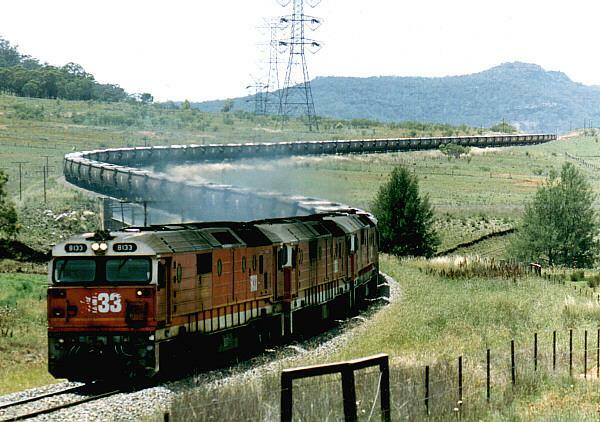 8152 leads RSA's track Inspection Train near Bowenfels on February 23rd, 1998. 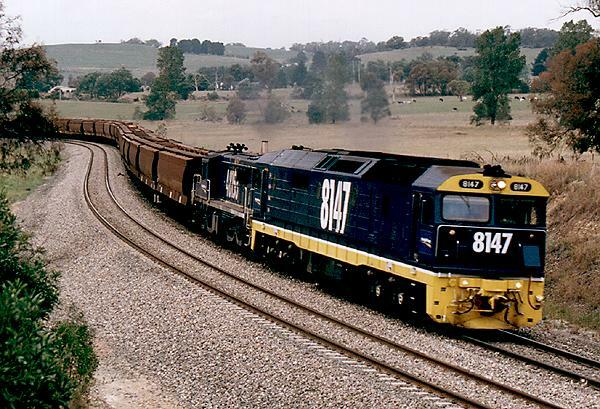 8152 leads RSA's track Inspection Train up the long 1 in 40 away from Cullen Bullen on February 23rd, 1998. 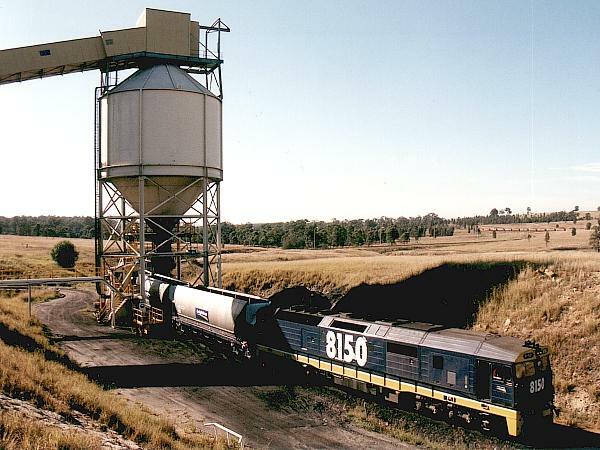 8152 leads RSA's track Inspection Train at Kandos Cement Sidings on February 23rd, 1998. 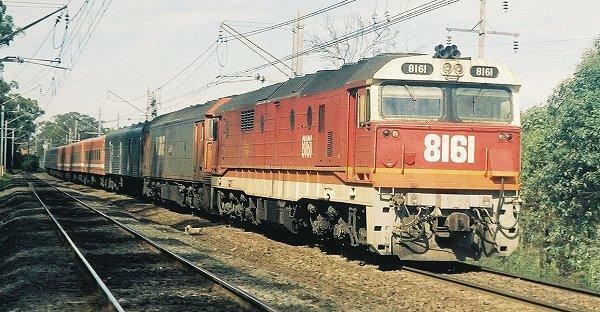 8152 leads RSA's track Inspection Train between Charbon Junction and Clandulla on February 23rd, 1998. 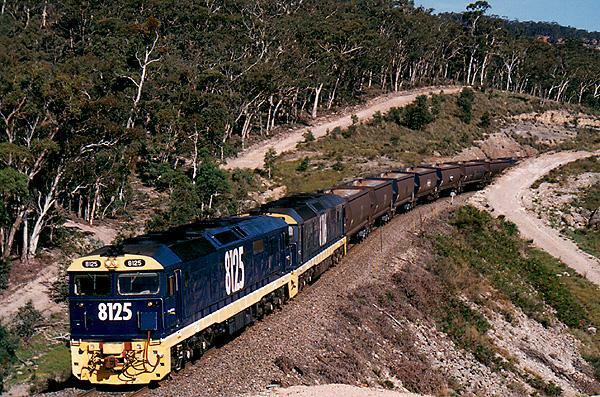 8152 leads RSA's track Inspection Train near Capertee on February 23rd, 1998. 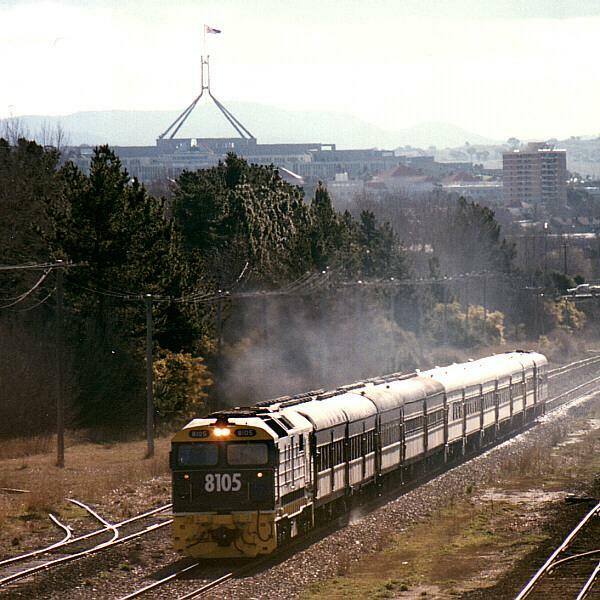 8116 departs Picton with a down clinker train on March 2nd, 2002. 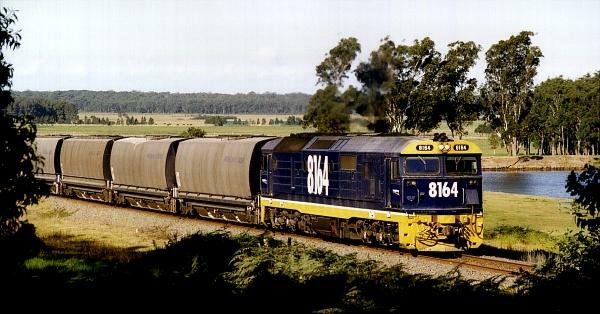 8153 leads another 81 on an up wheat train near Jerrawa. 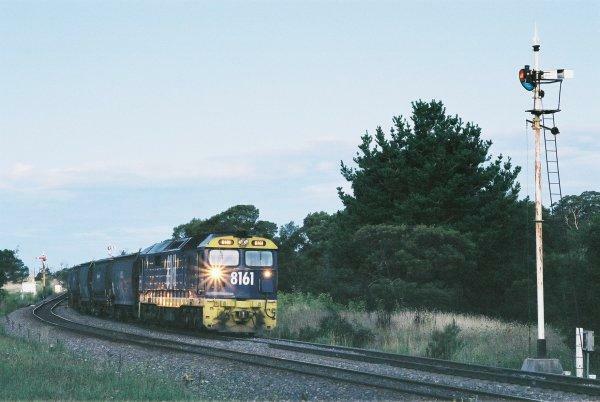 8155 & 8161 lead three 48s through Sutherland on a down wheat train. 8161 awaits line clear at Exeter. 8162, L254, 833, 4836 and L265 stand at Sutherland ready to return to 3986, after 42211 had been removed due to a pulled automatic coupler. 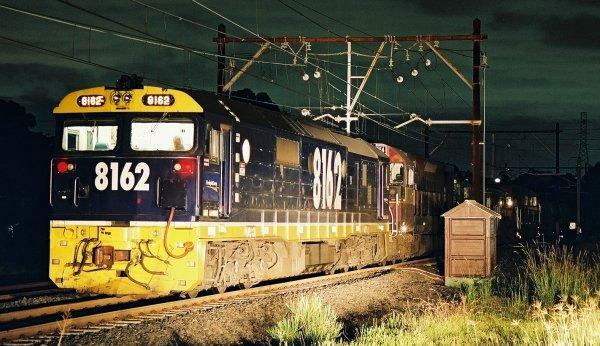 8162, L254, 833, 4836 and L265 couple up to 3986, after 42211 had been removed due to a pulled automatic coupler. 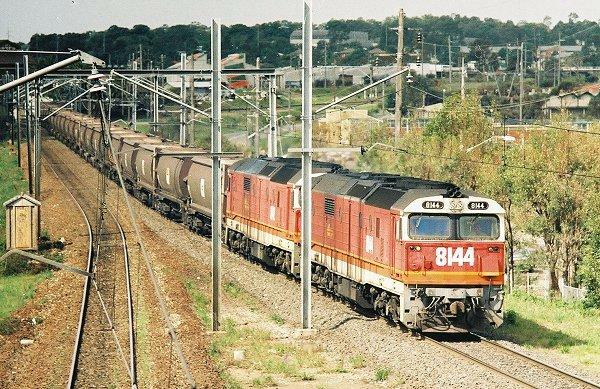 8147 & 48153 lead 5362, a grain train comprising of VLine wheat hoppers through Werai en route to Albury and beyond on January 24th, 1998. 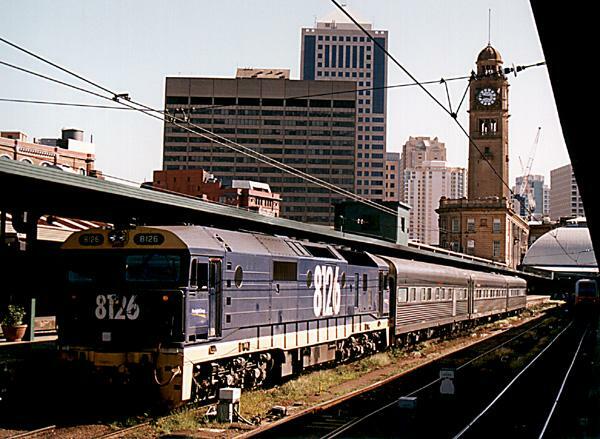 8126 awaits departure time on Platform 1 at Sydney Central with the three AK track inspection cars on November 24th, 1997. 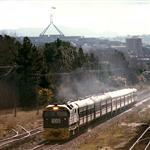 8149 & 8109 lead 2138, the up Canberra Oil train, across the Burbong bridge on October 18th, 1997. 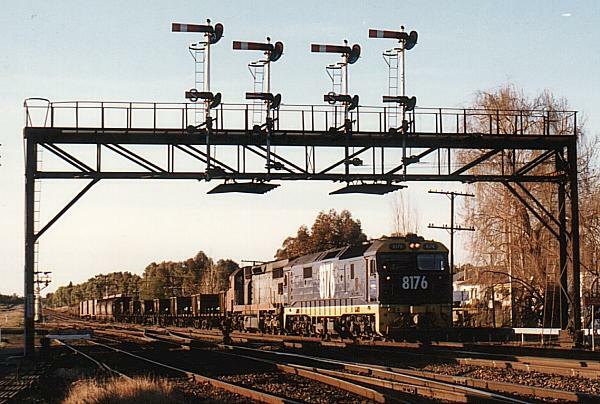 8176 & C504 lead 1NP2 under the semaphore signal gantries at Junee on August 3rd, 1997. 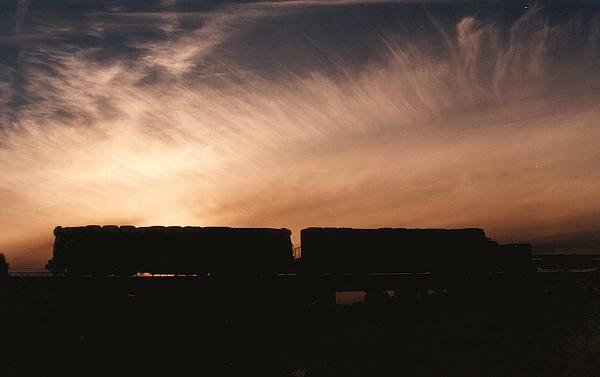 8176 & C504 silhouette with 1NP2 on the Wagga Wagga Viaduct at sunset on August 3rd, 1997. 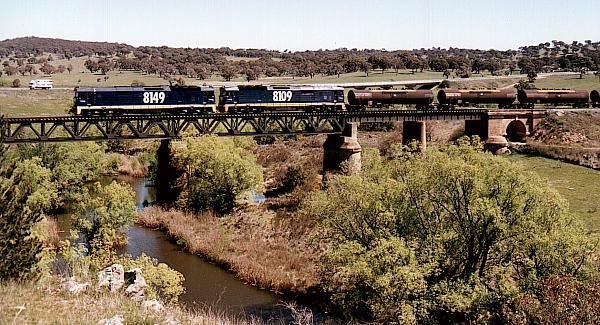 8176 & C504 lead 1NP2 across the Wagga Wagga Viaduct at sunset on August 3rd, 1997. 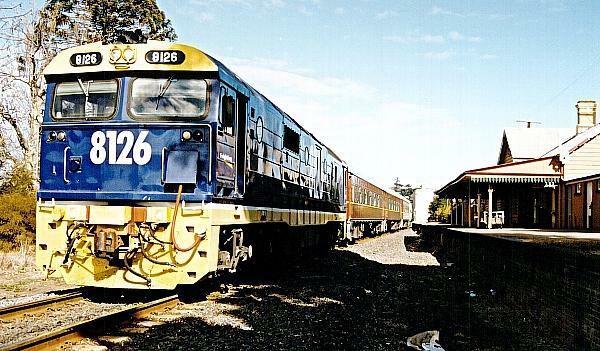 8126 pauses near Molong Platform with WL33 Orange to Broken Hill Passenger service on June 25th, 1997. 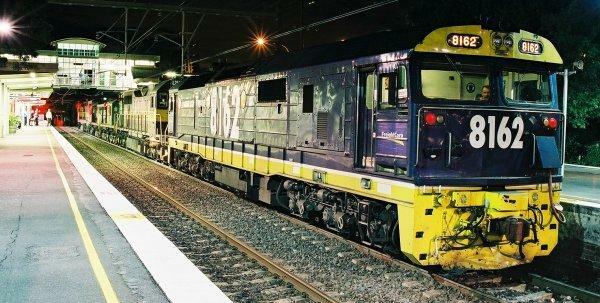 8126 pauses at Bogan Gate Platform to do the safeworking with WL33 Orange to Broken Hill Passenger service on June 25th, 1997. 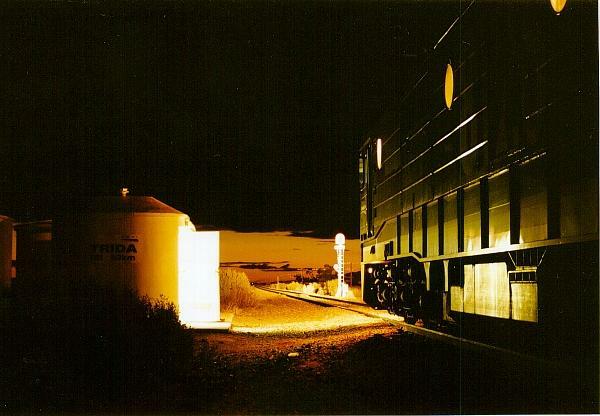 8126 pauses at Trida Staff Hut half an hour after the sun has set with WL33 Orange to Broken Hill Passenger service on June 25th, 1997. 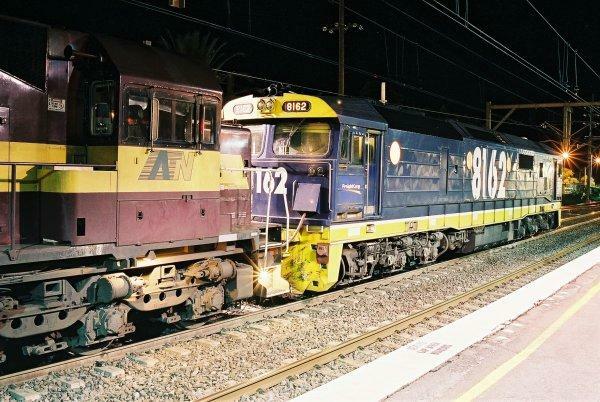 8126 awaits departure time at Broken Hill platform with WL34 Broken Hill to Sydney Passenger service on June 26th, 1997. 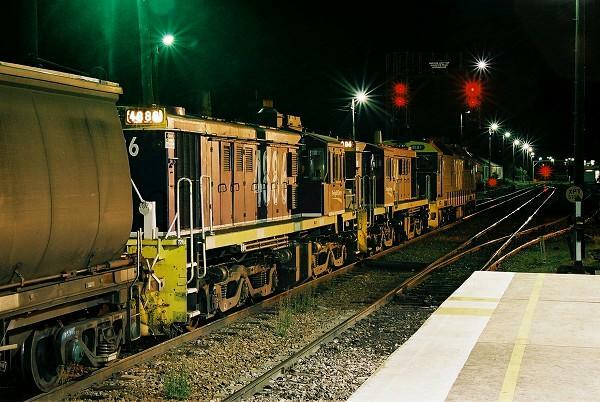 8150 waits at Mt Thorley Loading Bin 1 for track ahead to clear with a special test train comprising of 8 NHPH coal hoppers on June 5th, 1997. 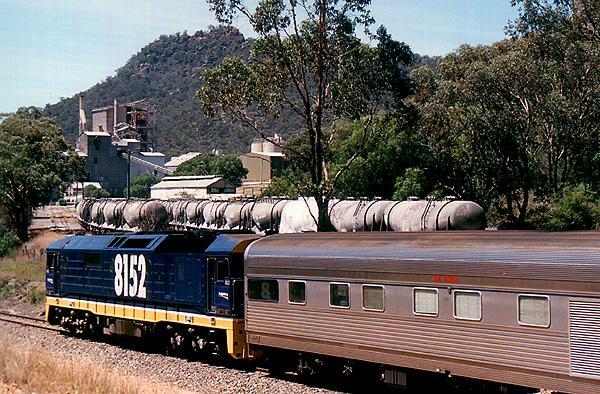 8150 with a special test train comprising of 8 NHPH coal hoppers waits at Whittingham Junction for NP24 Explorer from Moree/Armidale to pass on June 5th, 1997. The track the Explorer is on was recently tamped, thus causing the dust cloud. 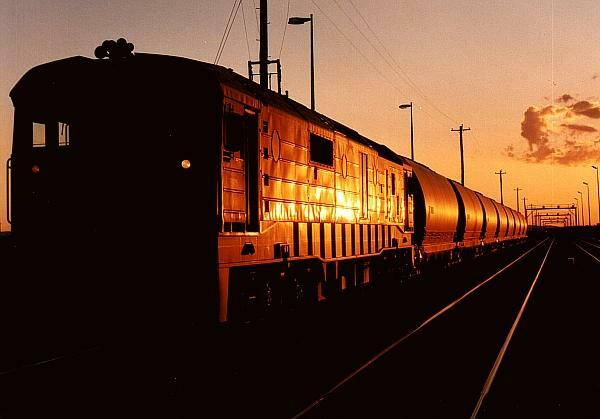 8150 waits on the arrival roads at Kooragang Island to unload a special test train comprising of 8 NHPH coal hoppers on June 5th, 1997 at sunset. 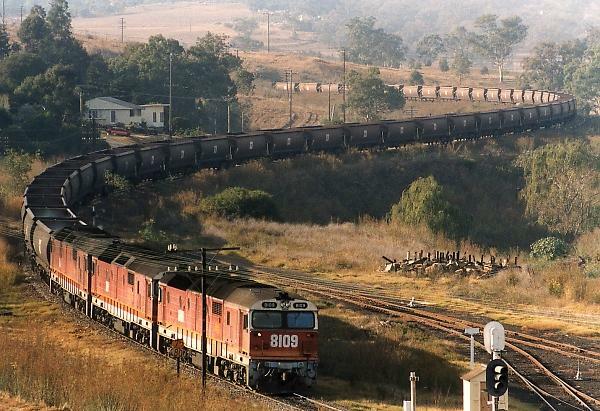 8146 leads an up coal train on May 5th, 1993. 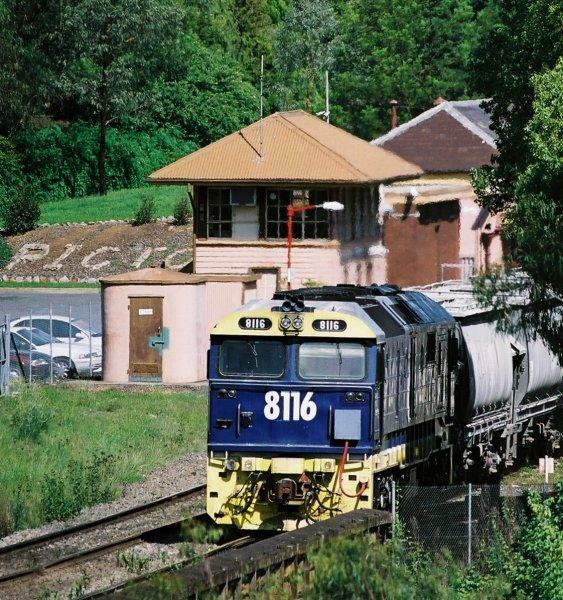 8164 on the down Nowra Freight climbs the slight grade between Toolijooa and Berry on May 1st, 1997.